The San Francisco Public Utilities Commission (SFPUC) has been working since 2011 to build a replacement Calaveras Dam out of seismic concerns for the existing 93-year-old dam in the Sunol Valley in Alameda County. To make space for the new earth and rock-fill dam, the Calaveras Dam Replacement Project has had to move almost 10 million cubic yards of soil and rock. 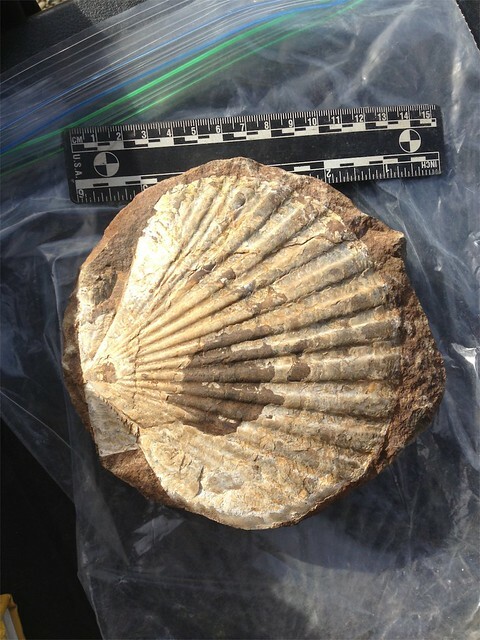 While moving all this earth, the project team began to find what has been called one of the greatest fossil finds in the Bay Area in decades. To date more than 1,300 specimens have been discovered. Most them are fossils from an ancient ocean and beach area approximately 15 to 20 million years ago. Water covered much of California back then, and an inland ocean extended to the Central Valley. Amongst the vertebrate fossils are marine mammals, like baleen whales or Mysticetes and toothed whales and dolphins or Odontocete; and Desmostylus, an herbivorous hippo-like marine mammal), seals or sea lions, sharks, and bony fish, such as halibut. The invertebrates include scallops (some as big as a dinner plates), clams, snails, cockles, mussels, crabs, and barnacles. The team believes it has found a new species of whale among the dozens of whale skulls found. Lab technicians assemble the jawbone of a whale. Researchers can tell this area was near to shore because they have also found plant material that washed into the ocean from land, including pine cones, palm trees, leaves, and wood. They can tell that the Bay Area was warmer back in this time, and the ocean teemed with life. Through an agreement between SFPUC and the University of California Museum of Paleontology (UCMP) the entire collection of fossils will now be housed within the UCMP collections. The fossils represent California’s fossil heritage and as such, belong to all the citizens of California, and will be managed on their behalf by the University of California Museum of Paleontology. The Paleontology Lab at UCMP is full of specimens ready for cleaning and identification. The UCMP assembled a team to manage this collection, including a Lab Manager – Dr. Cristina Robins, many undergraduate students, two graduate students per semester, and volunteers. Dr. Robins and her team painstakingly chip away the rock from the fossilized bone to identify each specimen. It is laborious work. They often find new specimens inside the rock blocks around other specimens. More fascinating fossil discoveries lay ahead for the UCMP team. And we at the SFPUC know the fossils are in excellent hands. See more photos from the construction site.